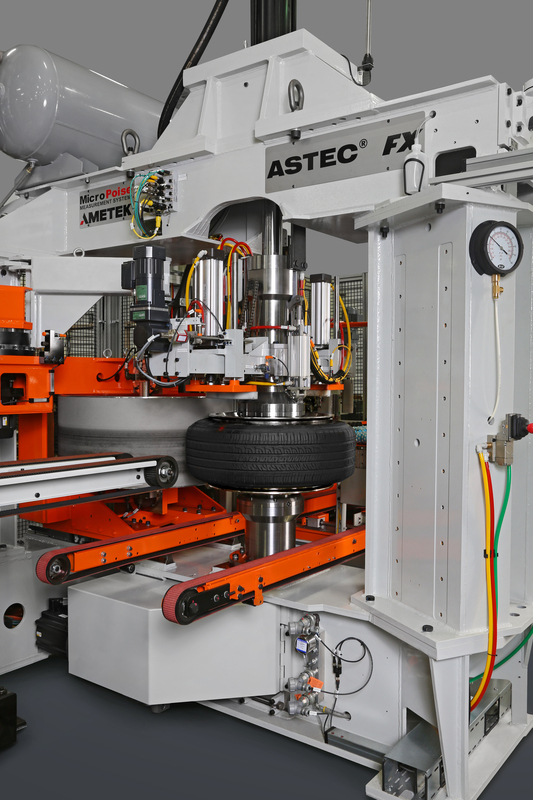 The Micro-Poise® ASTEC® FX is a complete Tire Uniformity System for measuring, grading, marking and sorting tires based on force variation, runout and sidewall appearances. This type of measurement testing most closely relates to ride disturbances that may be experienced in a moving vehicle. The ASTEC® FX test procedures and capabilities follow tire and automotive industry practices for tire uniformity testing while offering enhanced machine performance and measurement analysis. The ASTEC® FX series for radial passenger (PCR) and light truck (LTR) production testing is the most modern, comprehensive, fastest, and repeatable system on the market. It operates as a Stand-Alone system, or it can be combined with other Final Finish modules including the TGIS-SL®, Tire Grind Correction, Marking devices and Sorter Stations. It can also be integrated with AkroDYNE® FX Balance test station to create a single integrated system. On-screen diagnostic, troubleshooting tools, and documentation. PLC Status Screens help operators and maintenance technicians to insure continuous operation. Maintenance navigation screens, make it easy to do machine setup and repair. The best Measurement Repeatability of any machine in the industry. This means there is little machine error in the measurement – so more tires pass grade limits, and factory yields are higher. Optional integration for Barcode reading and angular referencing to barcode is offered and traced to measurement results. Its compact design and effective footprint lends itself to direct replacement of older equipment. The ASTEC® FX is designed for maximum access to the machines main components while also keeping the operator and bystander’s safe. The exit drop conveyor drops down for easy access to the testing station as well as any markers. ASTEC® FX comes with protective guarding and access doors around the machine. Access doors are interlocked for safety. This allows safe and easy access to the entire machine.